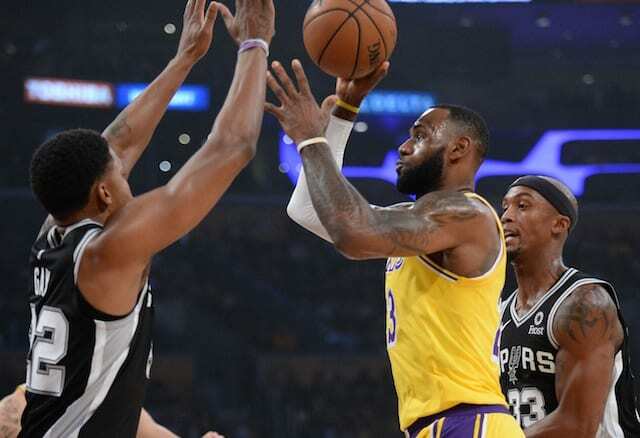 Suspensions to Brandon Ingram and Rajon Rondo meant a new-look Los Angeles Lakers lineup, and while they battled and made a comeback, a failure to get stops resulted in a 143-142 loss to the San Antonio Spurs in overtime. The Lakers are off to an 0-3 start to a season for the first time since 2016. Kyle Kuzma took advantage of an opportunity to start in his more natural position, pouring in 37 points to finish one shy of matching his career high. He scored 19 before halftime, which helped offset a peculiar effort from LeBron James as he missed his first six shots. James scored seven points early in the third quarter and if it wasn’t he or Kuzma carrying the Lakers offense, Josh Hart took the lead. Between knocking down shots and creating for others, he helped the Lakers keep pressure on the Spurs. However, to San Antonio’s credit, they had an answer for seemingly each run L.A. made. After Hart’s 3-pointer late in the third, Davis Bertans responded with one of his own to give the Spurs a 96-93 edge heading to the final quarter. Another such instance came with just under 10 minutes remaining in the fourth when Hart’s 3-pointer gave the Lakers a 104-103 advantage. It marked their first lead of the game since being up 3-2. The teams traded baskets from there, but back-to-back 3-pointers gave the Spurs a five-point lead that they never relinquished. LaMarcus Aldridge caused fits for whoever guarded him, at one point forcing Ivica Zubac into five fouls in five minutes in his season debut. Aldridge led the Spurs with 37 points to tie with Kuzma for a game-high. He provided what appeared nail in the coffin by securing two offensive rebounds on the same possession, and putting the second one in to give the Spurs a 128-120 lead that essentially iced the game. But the Lakers mounted a furious rally, capped off by back-to-back 3-pointers from Kuzma and James on the team’s final two possessions of regulation. James pulled up from well behind the arc to tie the game with 2.4 seconds. Sending the game into overtime led to Johnathan Williams (signed to a two-way contract last week) emerging as an unsung hero. He contested DeMar DeRozan at the basket on multiple occasions, picked up two blocks and scored four points in the extra five minutes of play. For all his dominance and impact on the game, James missed a pair of free throws with 11.2 seconds remaining to leave the door cracked for the Spurs. Patty Mills capitalized on it, nailing a go-ahead jumper out of a timeout to give the Spurs a win thanks to a 7-0 run to close the game. James had an opportunity to respond but missed his stepback jump shot at the buzzer. San Antonio led by as many as 18 in the first quarter behind a scorching start — making 11 of their first 12 attempts — going on a 19-2 run and shooting 73 percent. 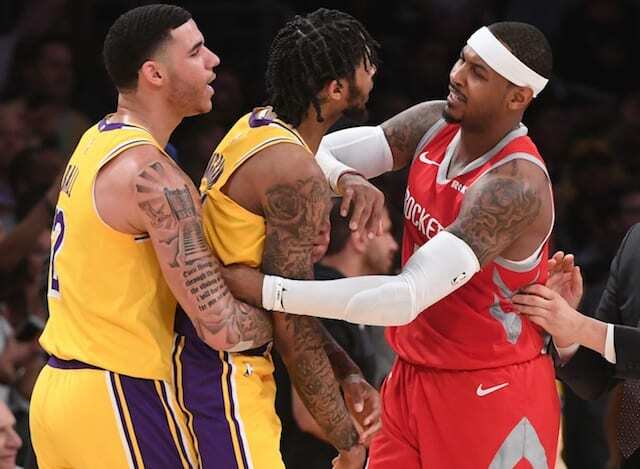 That allowed them to control the tempo of the game, but that began to switch in favor of the Lakers. It was no coincidence that the shift correlated to their climbing back into the game. Despite the loss, Los Angeles finished with an edge in rebounding, 52-47, and had 41 fast-break points to the Spurs’ seven.